Beautiful, durable composite decking is available to homeowners in Northern Virginia from Shiner Roofing, Siding and Windows. Since 1981, we have been the name trusted most for premium products and an impeccable home improvement experience. That is because we only offer our customers the finest products that are crafted by leading manufacturers and always install our products with the utmost care and precision and according to manufacturer specifications to ensure that they perform optimally year after year. Additionally, both of our composite decking options are exceptionally beautiful and are sure to enhance any yard that they grace with their natural-looking wood grain appearance. 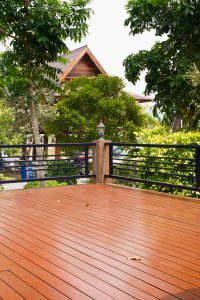 These decking options are also available in a vast array of luxury colors, so you are sure to find the perfect color that will suit the architectural style of your home. What’s more, when you choose either one of our composite decking options, your deck will be custom designed in any configuration you desire. It will also be backed by a long-lasting manufacturers’ warranty that covers material defects, staining and fading, and much more for added peace of mind. If you would like to learn more about our composite decking options, contact Shiner Roofing, Siding and Windows. We are proud to serve homeowners in Northern Virginia.